Japan’s space agency workers can now breathe easy. The pair of robots they sent hurtling toward the surface of an asteroid on Friday have landed as hoped and are already sending back images of their strange new home. 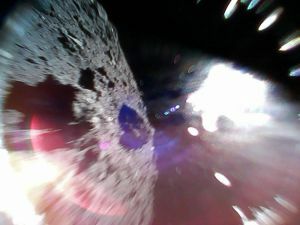 The Japan Aerospace Exploration Agency (JAXA) launched its Hayabusa2 probe back in 2014, and the craft is now orbiting Ryugu, an asteroid roughly 289 million kilometers (180 million miles) from Earth. On Saturday, the agency posted that the two exploratory robots Hayabusa2 sent toward Ryugu on Friday are “in good condition” and moving freely on the asteroid’s surface. It also posted new images that the bots sent back. The bots will now bounce around the asteroid as long as their solar-powered motors allow, taking photos like the ones below and gathering valuable temperature readings that could help us understand the history of our solar system and prepare for the future of asteroid mining.